All was still, cool and quiet. There was not a sound from the people below. However much they had read or had been told about the eclipse, nothing had prepared them for the strange reality. Even the insects had stopped chirping. 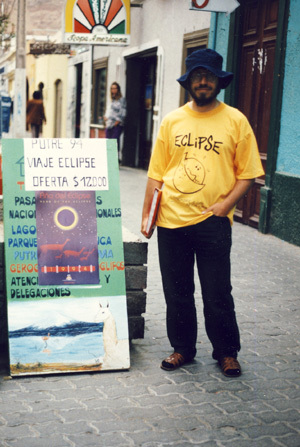 For the 1994 eclipse, Talaat and I travelled together in the Americas for exactly one year. We were joined for a month around the eclipse by a friend, John Mears. A long flight took us from London to Santiago in Chile. After a side trip to Easter Island (the first time we had driven on the right hand side of the road by ourselves! ), we spent nearly 2 months exploring this long thin country. We saw the eclipse described below in the north. A single carriage train took us to the highlands of Bolivia (6 weeks); another train took us to the fascinating Peru (2 months). In Ecuador (6 weeks), half way through the trip, we took a luxory tour of the Galapagos Islands. Colombia was 2 months of few tourists and unique sites. A boat took us to Panama (3 weeks). We then travelled overland though Central America: Cost Rica, Nicaragua, Honduras, El Salvador (where we were interviewed on local TV), Guatemala, Belize and finally Mexico. Our return flight was from Mexico City back to London. 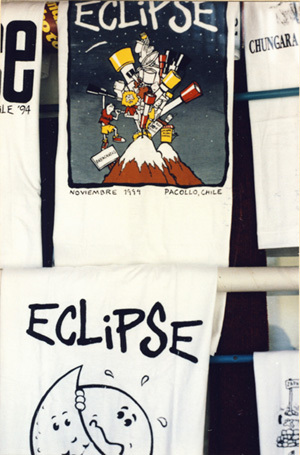 The 1994 eclipse was located in the extreme North of Chile. 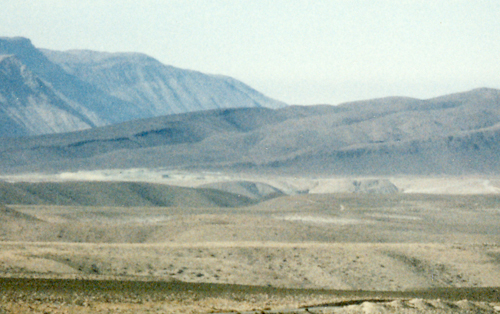 The low-lying coastal regions were part of one of the world's driest deserts, the Atacama. However there was frequent cover of low cloud. Only a dozen kilometres inland, the cloud vanished. Within 100km the land rose to a desolate plain over 4000m above sea level. Here was situated Lauca National Park. A good road covered this area from the coastal port of Arica to Bolivia. Our small group stayed in Arica in a pleasant pension recommended by a taxi driver. We hired a car and spent a week exploring the region enjoying the wildlife and looking for a suitable eclipse site. Our group consisted of John (a school friend), a Spanish-speaking American called Martin, Talaat and myself. We had met Martin in the southern Lake District of Chile. Because of potential problems with altitude, we were careful about ascending too quickly. We were also careful about driving. Although the road was a good paved highway, three of us were unused to driving on the right. Arica itself was a dull port town. We used it as a base as eclipse chasers from around the world descended on this humble border town. A church designed by Eiffel (yes the very same) and a German-built railway station were all there was to see. We met two Slovak astronomers sent by their country to observe the eclipse. One American woman would not be watching. She was married to a Chilean and was pregnant. Her husband's family thought it would be bad for the unborn baby. "I'm not superstitious but you never know ..."
All the newcomers wanted to know where I had bought my t-shirts from. I took so many people to the shop that I was given some for free by the grateful shopkeeper. Feeling a little homesick after two months travel we visited the British Consul. She was a friendly middle aged woman born in Argentina. She offered us tea and asked about the eclipse. She was, however, more interested that Talaat gave her some recipes for chapattis. Talaat was born in Pakistan and the Consul's daughter had lived there. She was worried that we were being overcharged for our accommodation. We had not been. Our landlady had no interest in the eclipse; she was planning to sleep through it! 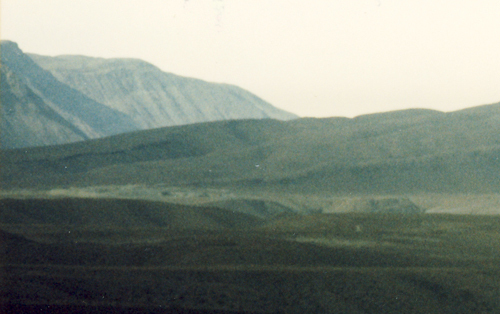 Outside Arica there was flat, featureless desert. On our first day's drive we missed our turning and nearly ended up in Peru. 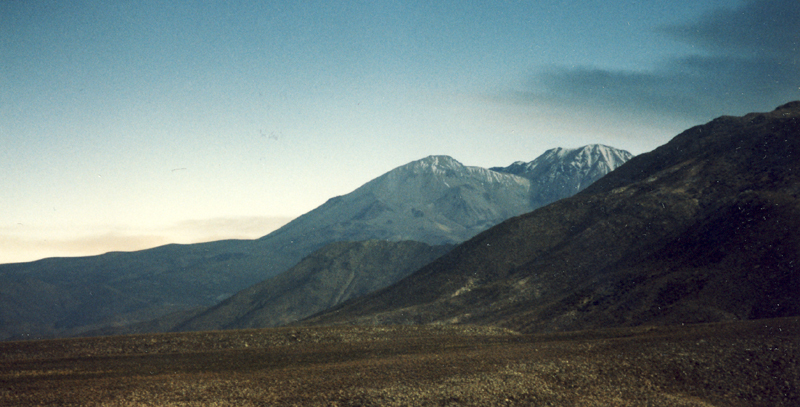 The road to Lauca followed the beautiful Lluta Valley. Along the valley walls were glyphs of pre-Columbian llama trains. This fertile valley has long been a trading route from the Bolivian altiplano. There were many colourful birds. The 17th Century church of San Geronimo in the village of Poconchile was one of the oldest in Chile. 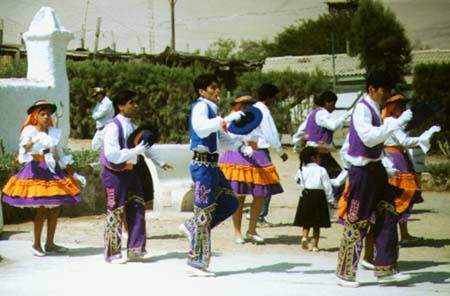 Brightly costumed Aymara people were preparing for the forthcoming Festival of the Dead which was due on the day after the eclipse. Festival of the Dead rehearsals at San Geronimo Church in Poconchile. As we climbed higher, the landscape became more barren. Candleholder cacti were common. They flower for only one day a year. They obtain their moisture from fog creeping inland from the coast. This is an area where rain is very rare. That is why we chose it as an eclipse site. On the Zapahuira plateau were an Aymara fort from the 12th Century and an 15th Century Inca Tambo (Inn). 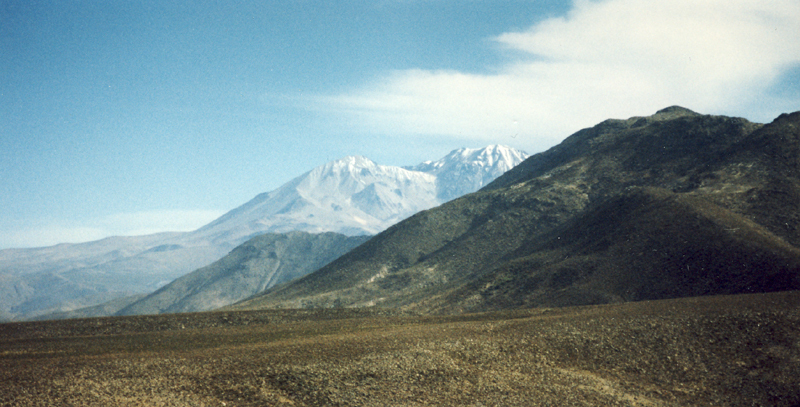 We were in an area surrounded by steep canyons and flanked by snow capped volcanoes bordering with Bolivia. Llamas and alpacas were plentiful, one of the few places in South America where they were protected. There were two pleasant Aymara villages (Socorama, and Parinacota) with cobbled streets, donkeys, oregano growing in the fields and lovely colonial churches with thatched roofs. The village of Putre was exactly on the centre line and 5000 visitors were expected for the eclipse. It was not a picturesque place and was beginning to look a bit too commercialised for our liking. Dormitory beds in the local school were costing $25 per person per night. On the altiplano itself we saw llareta. This is a bright green plant that resembles moss and is hard to the touch. It is used as a fuel. There were many herds of vicuña. These are wild, deer-like relations to llamas. They grazed on grass-like pastures called bofidals. These are found in swampy ground watered by streams. Another inhabitant was the vizcacha. These unusual animals were small and rabbit-like with bushy tails and huge whiskers. They lived in the spaces between large rocks above 4000m and hopped around like kangaroos. Beautiful black and white Andean Gulls soared overhead in the thin cool air, occasionally hovering over one spot. The Lagunas de Cotacotani had populations of giant coots and a few flamingos. 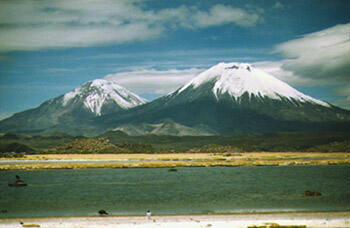 The waters here reflected the twin conical volcanic peaks of Parinacota (6330m) and Pomerane (6252m). 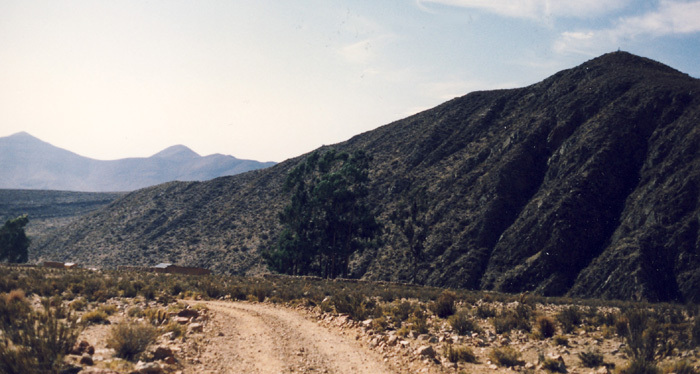 For our eclipse site we found an almost deserted village on the Zapahuira plain at 3314m. It was hidden from the main road but close to a 24 hour truck stop. It was 10km from the centre line but this would only lose us two seconds of totality. We asked some farmers for a place to stay. We were told that most of the houses were empty and we could use any one of those. We quickly found a suitable building. We parked the car between two buildings and set up our sleeping bags for the night. It was somewhat dusty but we found a broom and swept up. I expected the temperature to be lower than it actually was. To our surprise, we had a comfortable night and there were good, cheap meals a few hundred meters away at the truck stop. People were heading to Putre in increasing numbers. Many broke their journey at the truck stop. 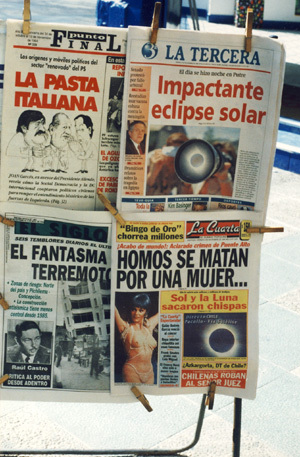 We spent the day chatting to everyone who had come for the eclipse: a group of Chilean Hell's Angels, an Italian sailor selling pendants made of mylar filter for viewing the eclipse, and a pair of Americans who had dropped out and were living in Colombia. A few kilometres away an artist had set up a railway carriage on the side of the road. He had painted and furnished it and was making good money running it as a pension. The local television station was there interviewing the eccentric owner. They talked to me when they found out I had already seen three eclipses. That night I slept well. At one point I wandered outside for a call of nature and saw a clear sky studded with stars. They were not the only lights, however. Along the main road was a continuous stream of car headlights as people were making their way to Putre. I was glad we were staying in this quieter village. Our eclipse site atop of the hill near the village. 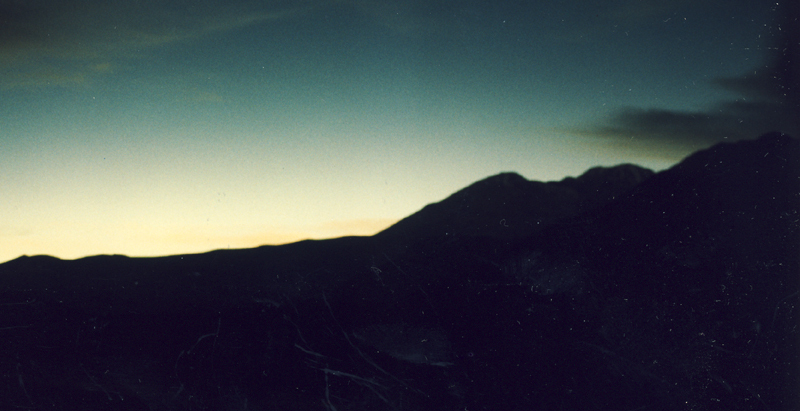 On eclipse morning, before dawn, we walked away from the main road, crossed a small stream and climbed a hill. It was dark but we had scouted the route the day before. It took us about thirty minutes because of the altitude. At the top of the hill was a crucifix at 3400m. The view was perfect: the plain below, canyons in the South, volcanoes in the North. It was cold until the sun came up; only then could we remove layers of clothing. It was difficult to believe anything was going to happen - it looked just like any other morning on the altiplano. At 8:17 the Moon touched the Sun: first contact. Using filters we could see the Sun had a bite missing from it. Below us we could hear murmurs of excitement from the area around the truck stop. Little changed as more of the Sun disappeared. By 9:00 we began to notice that the landscape was taking on a golden tinge as only the edge of the sun remained. However little of the Sun remained uneclipsed, it was still not possible to look at it with the naked eye. We still needed our filters. The scenery darkening as the eclipse progresses. 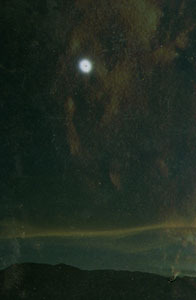 By 9:10 only a thin crescent of the Sun remained and the sky began to darken. We had warmed up after sunrise but now the air was noticeably cooling again. The voices from the truck stop fell silent. Events moved quickly as the shadow approached. View over the altiplano (9:00am, 60% eclipse). View over the altiplano (9:15am, 98% eclipse). View over the altiplano (9:18 am, totality). The Moon's shadow was moving at 1.4 km per second from the North West. The sky in that direction turned from blue to purple to almost black while we looked on in amazement. We heard a scream in the distance. Looking up we could see the final point of light from the Sun, the diamond ring. Then darkness. It was 9:18. View of the totally eclipsed sun. A black circle had replaced the Sun. Around that circle was the pearly white light of the corona. It looked as if it had been painted onto the black sky. This light was only about as bright as the full Moon. For the first time we did not need our filters. We were now bathed within the Moon's shadow. The corona during totality (Long Exposure). 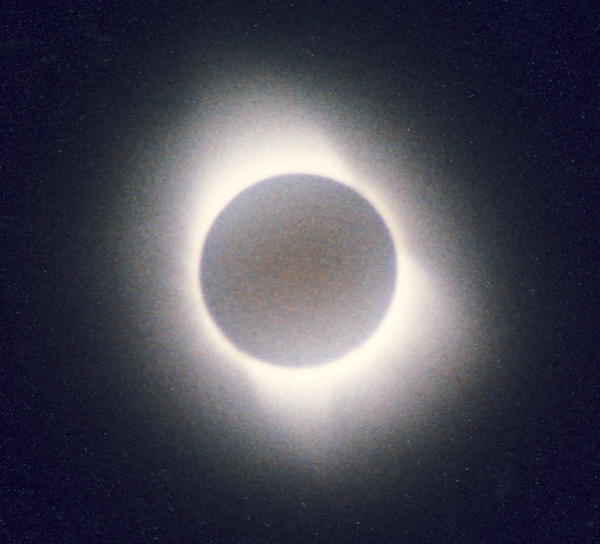 The corona during totality (Short Exposure). The shadow was an oval shape 286km long and 152km wide. We could see this by looking around. The horizon was pitch black in the East and West. In the North and South there was a red twilight glow. Near the Sun were two planets, easily visible. Venus was slightly above and bright while Jupiter was below and fainter. All was still, cool and quiet. There was not a sound from the people below. However much they had read or had been told about the eclipse; nothing had prepared them for the strange reality. Even the insects had stopped chirping. At 9:21 a red flame near the surface of the Sun could be made out, a prominence. It had been covered by the Moon but was now being revealed as the Moon prepared to move away from the Sun. Almost immediately, the first beam of sunlight appeared shining through a valley on the edge of the Moon. This is the famous diamond ring, so called because it resembles a point of light surrounded by a ring of fading corona. Within seconds, the total phase was over - it was no longer possible to look. The landscape returned to normal. Car horns blared their excitement. It was over. 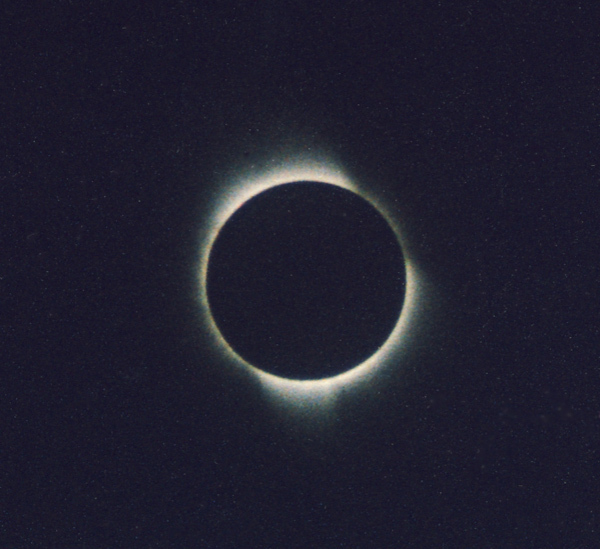 The Diamond Ring at the end of Totality. Back in the truck stop our young Aymara waitress could only nod dumbly when we arrived. A family was eating. They talked in whispers and the old mother kept crossing herself. There was a sense that something special and unique had occurred. Altiplano views (with shadow) by Talaat Qureshi. Photo captioned "View of the totally eclipsed sun" bought in Cuzco, Peru. All other photos including totally eclipsed Sun by Kryss Katsiavriades. 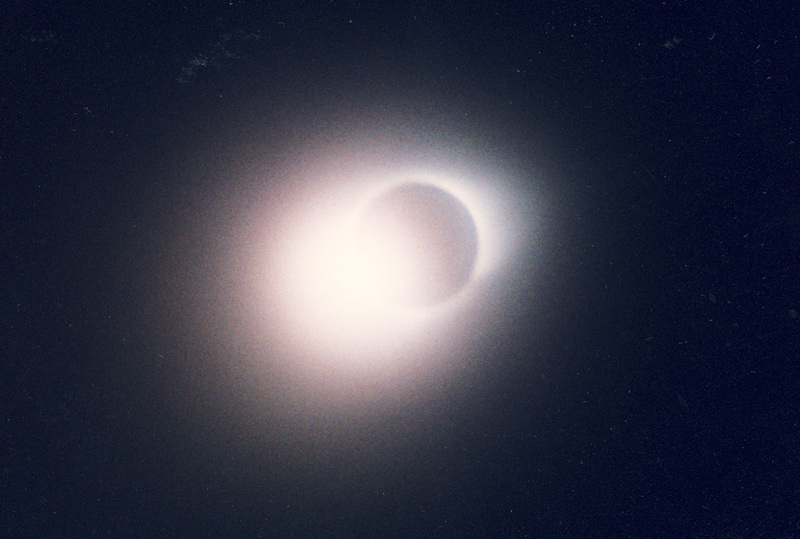 The 1994 eclipse main page. Maps of the path and a diagram of the sky at totality of the 1994 eclipse from Fred Espenak and eclipse details at the observation site. A photo of the four people at this eclipse. A travel account from Bolivia's Lake Titicaca across to the Peruvian side of the lake followed by a train trip to Cuzco, the centre of the Inca empre. 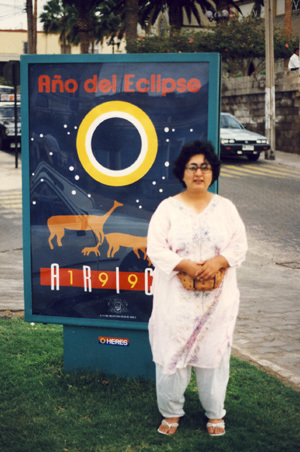 This journey was part of a one year trip in South and Central America which included the 1994 Total Eclipse of the Sun in Chile.